Join us as we continue to explore this region, visiting the four different ski resorts - each one a gen of its own, with a distinct personality. 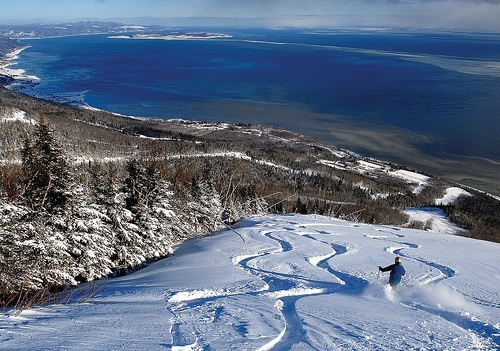 Do you want gradual groomers, glistering bumps, tenacious tree runs, spectacular scenery, tranquil Nordic trails, a unique spa treatment (or two?). v 5 American buffet breakfasts, with french pastry, mais oui! v Free access to the resort facilities (outdoor hot baths, indoor heated pool, Finnish sauna, Nordic shower, Polar bath and yurt with a fireplace). v Visit the nearby town of Magog and Lake Memphremagog - you'll be able to pronounce it before you leave.